Playing Appreciated is a group for members that like to play games they win and for giveaway creators that like to see their games getting played. This sounds simple, yet requires committent and dedication from members by filtering out games they like to play from all group giveaways and when won playing those within one month. In return members will get higher chances of winning games they want and creators will know their giveaways have a high chance of getting played. The group has more than 800 members and over 9000 historical giveaways. When creating a giveaway it is recommended to include a small group rule reminder in your giveaway, something like: "This is a Playing Appreciated giveaway, by joining you commit to playing this game within a month when won.". Option 1: Showing your commitment by playing a previous won game on SteamGifts that you did not yet play. The game shouldn't be very short and must have achievements. Comment with the name of the game before you start playing it and comment again when you finished playing it. Please upload some screenshots to Steam as well. Option 2: Supporting the cause by creating a group giveaway of a game that you would like to see getting played by other group members within a month as soon as your membership request was approved. The game should not have been given away free before (marked by ** when creating a giveaway on SteamGifts). Wait for us to approve your request, we'll always reply on the comment you have made in this topic. More information and a FAQ is available via the Steam group. Current group giveaways can be found here on SteamGifts. Feel free to comment below if you have any questions! Just won The Walking Dead Season 2 via Unlucky 7, but I noticed hot it was a PA giveaway too. I was already thinking about applying for the group. Question is: can I play TWD S2 as a joining test or is it too short? I mean it is an episodic game that should take 10-15 hours at most. If it is too short, I can play F1 2015 for my "CV" to join PA (that is another game I won recently and haven't played just yet. May i join the group ? Hi mstrkllr, as you were already told a year ago, you are welcome to join but you have to choose an option you would like to join with. 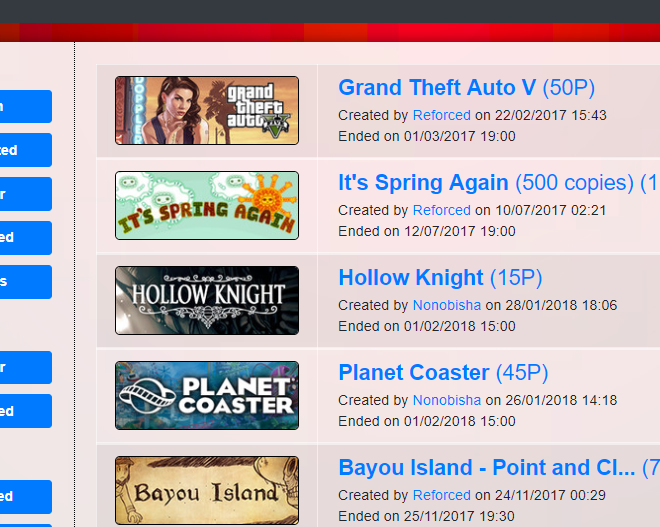 Hi harutgamer, sure you can rejoin the group as soon as you play the 13 games you have won in the group previously and didn't play, before that: no. best bit: the members page avatars looks truly awesome. just one question: have you changed the blue of text? looks "shinier" than before or is just me, as usual...? Thanks icaio! Happy you like it. Still some more fine-tuning that can happen here and there, but it's workable! ^^ As for the blue; you have a sharp eye! Seems that between Bootstrap v3 (= the old) and Bootstrap v4 (= the new) the creators of it changed it (what is bootstrap you ask? well it's like the pencil box to make the drawing :P). heard of this pencil before, didn't really know it was a pencil, tho. and while checking it a little, a very little, i've noticed a tiny thing in their Twitter account... like a "follower", a "massive" one, that i quite know (yes, i'm vague). and this is just a placeholder for a future -bootstrap- comment. :P and <3 +a bump, cause... why not? we're in the PA thread! oh, sure thing! i mean, how to deny a request made by PA admin?? Howdy! I would love to join using Option 2. Thank you for the consideration. Great! I have my first giveaway up now. Hello I would like to join the group with option 1 and play Deponia, the complete journey (my first and only win so far). Hi givenchyjr! You're welcome to join by giving away something you'd like to see getting played. :) Please request to join here and we'll approve it when we spot your request. This is a great idea - to play the games in which you won, and not to postpone them for later. I am from Russia and I would like to try this direction. I think this is a good motivation for those who get games and put them in the background instead of playing them right now. I'd like to try that. True, the power of my computer is not enough to play some new items with huge system requirements, I like light pixel games or small indie projects. Hi PaulaShen! You're welcome to join, just be cautious with what games you join then given your PC specs. :) With what method do you like to join? I wanna join the group through option 1. I'll play Tomb Raider, if that's OK. Its a game I won a long time ago, it was installed back then and I never got to play.